Pav Bhaji: Pav bhaji is an Indian fast food dish that originated in Mumbai cuisine. While Bhaji is a traditional Indian name for a vegetable dish, the Pav or Pau or Pao was the Portuguese word for bread (small rolls). The pav bhaji is a spicy preparation with a mixture of vegetables, either whole or mashed, a generous dose of fresh tomatoes, a dollop of butter, optional toppings of cheese and dry-fruits and fresh fruits, consumed with warm bread gently or crispy fried in butter. Boil all the vegetables except onions, tomatoes and capsicum in a pressure cooker. Finely chop the onions, green chilies, tomatoes and capsicum. Once the vegetables are cooked, peel the potatoes and roughly and mash the cooked vegetables. Melt the butter in a pan, on medium heat. Add in the cumin seeds. When the cumin seeds sizzle, add in the chopped onions. Sauté till the raw aroma of the ginger-garlic paste disappears. Fry for half a minute. Fry till the tomatoes become soft and mush, takes about 6 to 7 minutes on low to medium flame. Add in the red chilli powder, turmeric powder, pav bhaji masala add garam masala powder. Fry for a couple of minutes till the capsicum become a little soft. Add in the mashed vegetables. Add in the water and season with salt. With a potato masher, mash the veggies directly in the pan. Keep on stirring occasionally and let the bhaji simmer for 12 to 15 minutes on a low flame. If the bhaji becomes dry and then add some more water. Garnish the bhaji with coriander leaves. In a frying pan, melt some butter on medium heat. Slice the pav in half and fry them lightly in the butter. Pav bhaji is ready to be served. Serve pav bhaji with chopped onions and sliced lime on the side. 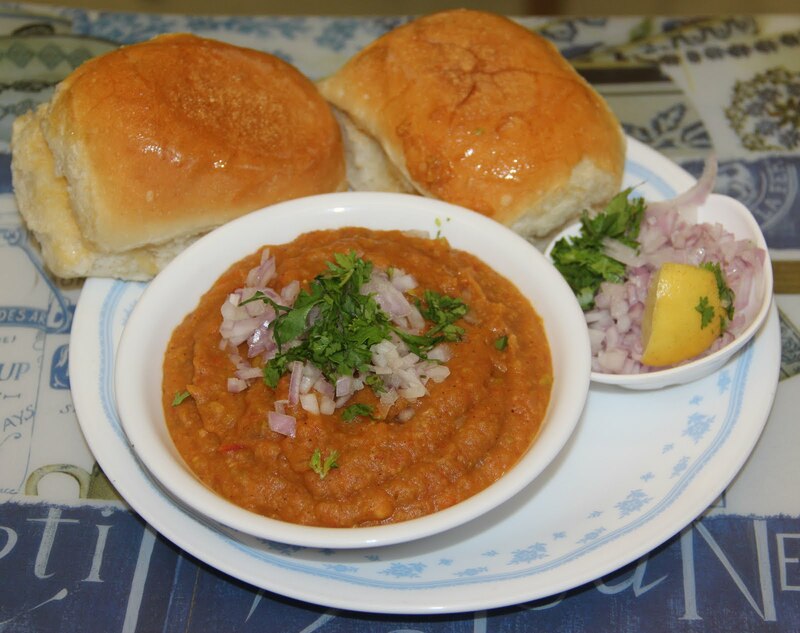 If you have any queries regarding the Pav Bhaji recipe, please leave a comment.